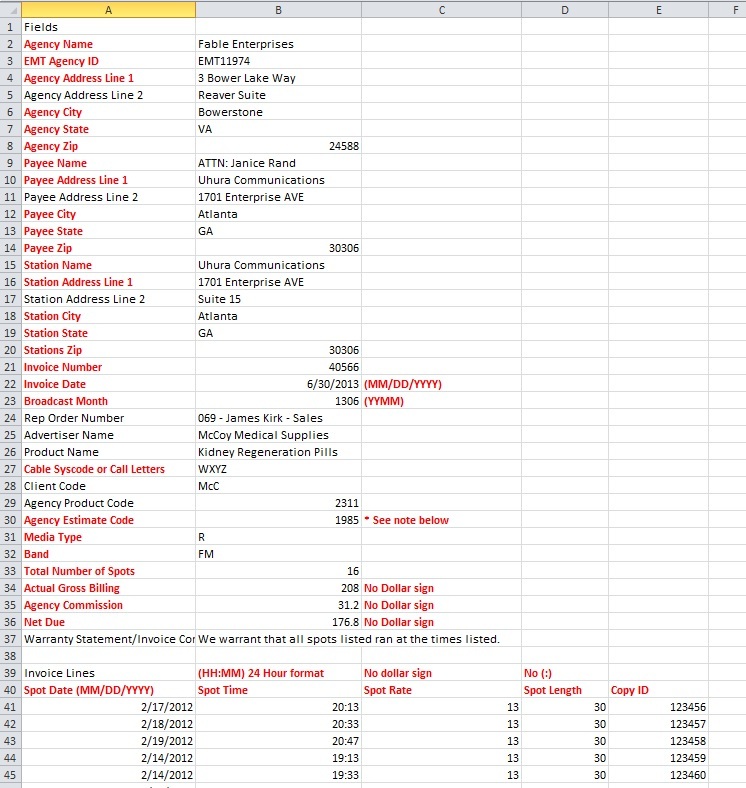 This guide sheet shows the layout of the Excel invoice template. The station will replace the sample data on the template with their actual invoice data. The fields in red text are required. The date and time fields must be formatted as shown above. Fields with dollar amounts cannot contain a dollar sign. This rule also applies to the Client Code and Product Code fields if the agency requires them. The completed invoice must be saved as a .csv (comma delimited) file. 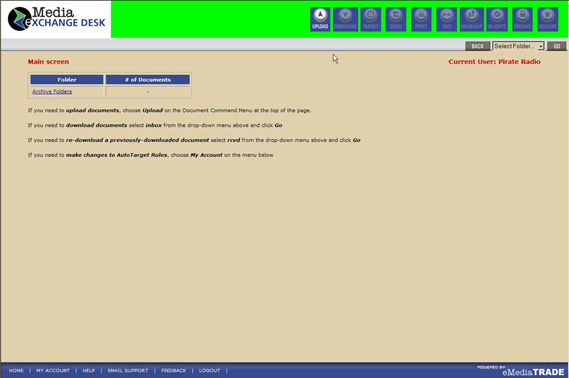 To upload the file, click on the highlighted “Upload” button in the upper right portion of the screen. The next screen that opens up will be a “Document Upload” screen. Click the “Browse” button to navigate to the file to be uploaded, and choose that file. Once the file is listed in the “File to Upload” window, click the “Upload” button to send the file to our system. That’s all there is to it! The file will now be in queue to process. Depending on the size of the file and how busy the system is at the time, the file could take a while to send. Typically though files are processed within a few minutes, but if it is a particularly busy day it could take a couple of hours. NOTE: When files are processing, a message will display on the Main screen that says “MXD is currently processing (a number) of your files”. As the files are processed, the invoices will either auto-send (based on target rules) or remain in the Outbox. Target rules and how to deal with documents stopped in the outbox are topics for other sessions. NOTE: If a file fails to process, a message will show on the Main screen that says “MXD was unable to process (a number) of your files. Please contact Support for an explanation of this error”. Nearly every time this happens it’s because a PDF file was uploaded instead of a data file. If you have any further questions, you can reach us at 770-642-7440. Support is available from 9am to 6pm ET, Monday through Friday.